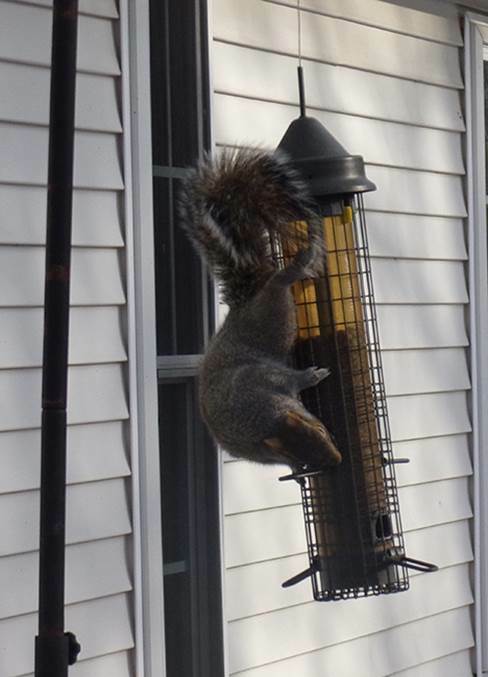 Squirrels testing the feeder in Pittsfield. 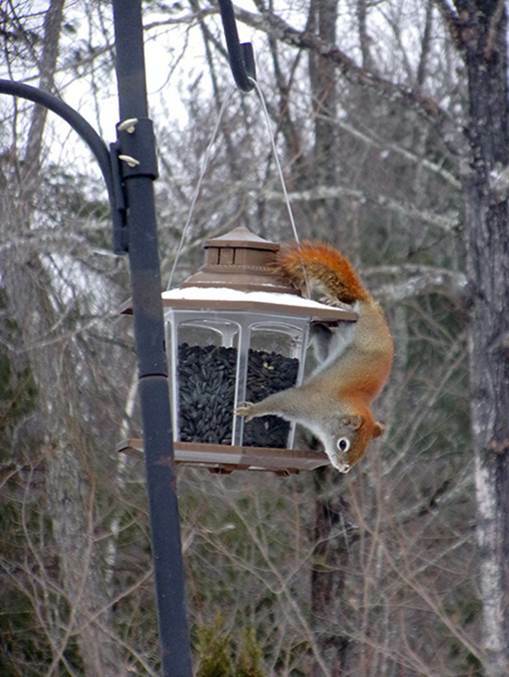 How easy is it to eat from? Three wrapped 1,000 pound bales are fed out everyday to the cattle... more in frigid weather. 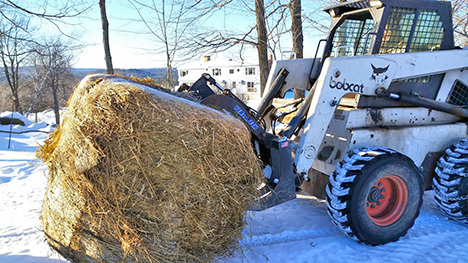 Bruce, driving the Bobcat skidsteer, delivers two unwrapped bales to hungry cattle. 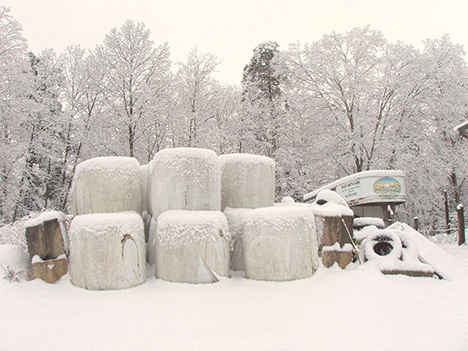 On the coldest days, we dish out four or five 1,000-pound round bales of wrapped hay called baleage. After it's cut, grass used for baleage is allowed to dry just a bit. It's best when only 40 percent of the moisture in the grass has evaporated. Then this wet grass is then rolled into large, round bales, wrapped with mesh and covered with plastic. The plastic wrap creates an airtight seal that allows the hay to ferment. Without the plastic seal, the damp grass would rot. Sealed, the wet hay ferments into a delicious, juicy meal; high in protein and pleasing to a cow's palate. Once a day we strip the wrapping off three to five round bales, depending on the temperature, and husband Bruce carries them two at a time out to the pasture. He's really strong–especially when he's driving the skid-steer tractor. Then the ground crew, usually me, strips the plastic and removes the inner lining. This task can get painful and frustrating when the plastic cover or the inner mesh wrap freezes into the hay. That's when I have to take the gloves off my already frozen fingers and pick at the wrapping. Brrrr. As I look at the 60 bales of hay in the baleage pit (a concrete bunker for storing feed) and think, “Half my hay by Ground Hog Day,” I know I'll have to buy more hay. Thankfully, Howard Pearl, a state legislator, and sixth-generation Loudon farmer, has plenty of bales to feed my hungry herd. Meanwhile, I'm hoping for a nice, cloudy, non-groundhog-scaring February 2 with an early spring, and plenty of free grass ASAP. New Hampshire author Kathy Stoughton will be at the library introducing her book “Where Did All The Money Go?” There will be a mini workshop, some crafts, and games with playing store! The book is written for four to six year olds, but bring the whole family to the workshop. The snow date is February 16, 2019. It can be FUN and important to teach young kids about money. Come and see how you can help young children build strong thinking skills and acquire the building blocks to manage money. In 2006 an Economic Development Committee (EDC) was established as a first step to stimulating much needed economic growth within our community. Between 2006 and 2010, many volunteer groups and individuals worked vigorously to accomplish the foundational work necessary to begin taking on some sustainable economic development projects in town. Such activities included establishing a Property Acquisition & Redevelopment Expendable Trust Fund in 2008 ($100,000), adopting RSA 79-e (tax incentive for businesses to expand in town) adopting ERZ162 (state tax credit offered to businesses) placing state business signs on Route 28, updating economic profiles and strategies and establishing the Suncook Valley Regional Development Corporation (SVRDC) in 2009. After a year of a lawyer working pro bono with members, the SVRDC received its tax exemption status in 2010. The purpose for establishing the SVRDC was “to work in conjunction with the Town of Pittsfield and its representatives in promoting and developing the growth, prosperity, and general welfare of the Town of Pittsfield and the surrounding region.” Given the various town owned properties to consider for economic restoration and/or enhancement, the SVRDC would work with developers and/or businesses in receiving, expending and administering funds from public or private sources as well as borrowing and lending. The SVRDC would also have the capability to receive by gift or otherwise acquire real estate and to participate in its development and resale, lease, or other disposition to further the economic development goals of the town. To date (13 years later) neither the SVRDC or the property redevelopment fund have been utilized for their intended purpose. A petition warrant article has been included on the ballot to discontinue the fund and return the $100,000 to the taxpayers. I believe it is in your best interest to support this article on March 12th. The board reluctantly accepted the resignation of Cemetery Superintendent Don Fife. After 46 years as full-time caretaker (more if you include part-time as a kid), Don has decided it’s time to move on. The trustees will be hard pressed to find a way to replace him. I’ve never heard one word of complaint about the way our cemetery looks- thanks to Don. We gave the town warrant a final going-over before the deliberative session Feb. 4. Anyone wanting input on the final version must attend the deliberative session where changes to some articles are allowed. We reviewed and approved the municipal operating budget of $4,505,380 proposed by the budget committee. Your select board and budget committee have gone over every proposed expenditure with a fine-tooth comb and believe there’s no waste anywhere in the budget- it’s what’s needed to meet our obligations and keep the town running at a safe, effective level. Next year’s operating budget is $14,000 higher than 2018- (a modest 3/10’s of one percent) mostly due to an increase in insurance costs. A bottom-line budget increase of $173,000 is primarily because of repairs that must be made to the Clark’s Pond dam in a separate warrant article. If we don’t repair it, the state will make us remove it, which ironically would cost more. We also must play catch up setting funds aside to replace equipment as it wears out, also in separate articles. Watch The SUN for explanations of expenditures the budget committee will submitting. Countless hours have been spent laboring (and frankly agonizing) over what to ask taxpayers for- please take time to understand what the town’s needs are. We’re still focused on doing anything we can to responsibly keep taxes under control. Please vote NO to the upcoming warrant article #31, replacing the Housing Standards Ordinance. What this article is stating is to shut down the HSA in our town. Without bi-annual inspections from the HSA of the 550 rental units, structural, safety, and health issues can be overlooked for years. Just this fact could be detrimental to the tenants as well as the landlords. The HSA is not in place to add undue expenses to the owners, it is simply there to protect the tenants as well as the owners from harm and litigation. After the inspection of apartments in the town, it has been noted that there were several safety violations that would not have been corrected that were unknown to the owner. If the HSA had not inspected the apartments, these items may not have been brought to the attention of the owners. The HSA's only concern is the safety of the tenants and cooperation of the owners to repair all issues noted on the inspection report. The HSA strives to be self-funded and uses no tax payer dollars. If this passes, all complaints will go through the selectmen and the fire department. The fire department is already limited in their resources and it would be a burden on them. You will no longer have one person who will deal with your complaints directly and immediately. We are trying to be proactive, not reactive. We are all entitled to a safe place to call home. At 10:30 am on Saturday, February 2nd, New Hampshire author Kathy Stoughton will be at the library introducing her book Where Did All The Money Go? There will be a mini workshop, some crafts, and games with playing store! The book was written for four to six year olds, but the whole family can enjoy the workshop. The snow date is February 16, 2019. It can be FUN and important to teach young kids about money. Come and see how you can help young children build strong thinking skills and acquire the building blocks to manage money. Story Hour for babies, preschoolers, and families meets on Thursday at 10:00 am will be learning about transportation. The Adventures Club (kindergarten thru 3rd grade) that meets on Tuesday at 3:30 pm, Creating Adventures (3rd thru 6th grade) that meets Wednesday afternoons at 2:00 pm are continuing to work out some Lego design challenges. A Lego car race will be held at the library at 5:30 pm on Tuesday February 19th. The Book Worms will gather at 6:30 pm on Tuesday February 12th to discuss Flame in the Mist by Renee Ahdieh. The Pittsfield Writer’s Circle will meet at 6:30pm on Tuesday February 26th, bring your latest work to share and hone with this dedicated group of writers. The adult book club will meet at 10:30 am on Tuesday January 22nd at the Pittsfield Senior Center to discuss The Hate U Give by Angie Thomas. Anyone who would like to join the book discussions can pick up the books at the library, come and enjoy some spirited conversation. The next gathering of the Chichester-Epsom-Pittsfield Libraries Memory Café will be held at 2:00 pm on Monday February 11th at the Epsom Public Library. Local caregivers and folks living with memory loss can come and relax in a supportive environment; refreshments will be served. A barn assessment grant from the New Hampshire Preservation Alliance has been approved for the “library barn.” The assessment will include a structural analysis, general care and upkeep, re-use strategies and budgeting for a potential revitalization plan. The assessment report will be available in the spring.